This and two further ‘standards’ (‘Brazil’  and ‘Green Eyes’ ) can be conveniently taken together, appearing as they did on the same Ventures album, recorded in 1977 but not released until 1979 (in Japan). First, ‘The Breeze And I’: in the hands of The Shadows – and Norrie Paramor – this fine composition is invested with a majesty reminiscent of a number of the orchestral versions that appeared with regularity from around the time of the Second World War. 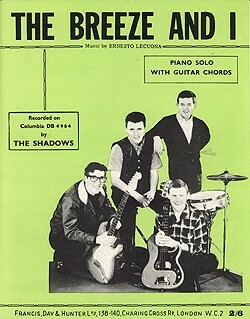 The Sound Of The Shadows album-opener ‘Brazil’ from 1965 has tremendous poise and attack with that resonant Burns guitar used to full effect, while their toe-tapping ‘Green Eyes’ from 1967’s Jigsaw LP boasts a distinctive blend of the selfsame guitar, mandolin and xylophone. 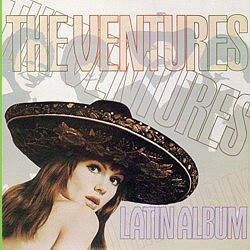 The Ventures’ Latin set is a whole different ball-game: rather than label it MOR (a term regularly, and often hazily, employed in RI journalism in a dismissive or pejorative sense, as if MOR music-making as a class is totally devoid of merit), I would think of it rather as straight late-night, easy-listening material. Recall that around this time it was precisely this sub-set of MOR that was beginning to exert a hold on the US charts, a hold tightened in the 80s. The Ventures were nothing if not masters of surprise, the main surprise here residing in the fact that Nokie Edwards was back on lead guitar and might have been expected to inject a degree of clout and flair into the music-making. The record has its occasional high points, it is true. Yet at best it seems hard to move beyond Davy Peckett’s description (despite his enthusiasm for the set) “It is a very pleasant LP” (New Gandy Dancer 14  3). For me, the overall effect is that of listening in on one of those dance-bands with a resident guitarist in the 50s and early 60s: technically adept yet somehow soulless and remote. The beginning, middle and end of ‘The Breeze And I’ are uniformly dull, ‘Brazil’ swings slickly and is miles better though hardly sparkling (couldn’t they have done something more distinctive with the outro? ); ‘Green Eyes’ is not exactly attention-grabbing until Nokie breaks away – not before time – for an improvising spell at 1:45, and following a lull there are sparks of life again after the three-minute mark. Still, fitful bursts of vitality, or sporadic displays of dexterity, call it what you will – even when it is Nokie at the helm – do not make a good album.